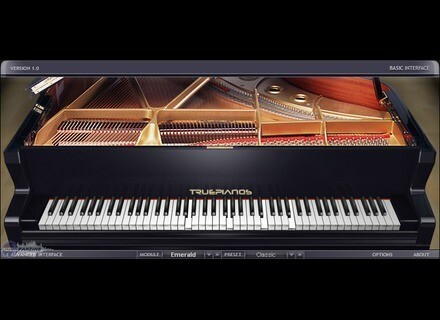 TruePianos, Virtual Acoustic Piano from 4Front. 4Front Technologies has updated TruePianos to version 1.9.0 and announced a special 33% Christmas Discount offer. The Christmas Discount on TruePianos will run from 22nd December, 2010, until 22nd January, 2011. Existing discount coupons and cross-discount deals are valid on top of the holiday discount. Additionally, every TruePianos customer (new and existing) can get a $50 flat discount coupon code for use on Rayzoon's Jamstix 3XL/3P/3XXL and Jamstix 3 Studio products. TruePianos 2.0 technology preview module Atlantis (requires SSE2 capable CPU). Engine updates for Atlantis module. Mac OS X 64-bit AU support. Compatibility updates for Windows Vista/7, Mac OS X 10.6. Crossfire Designs MIDIPadz Lite Crossfire Designs has announced the release of MIDIPadz Lite, a free, simple and easy to use drumpad controller for the iPad. Native Instruments Mikro Prism Mikro Prisp is a new free instrument, based on the successful synthesizer Reaktor Prism. Loomer Shift v2 Loomer has released an update to Shift, the diatonic granular pitch shifting delay effect, for Mac OS X, Windows and Linux.